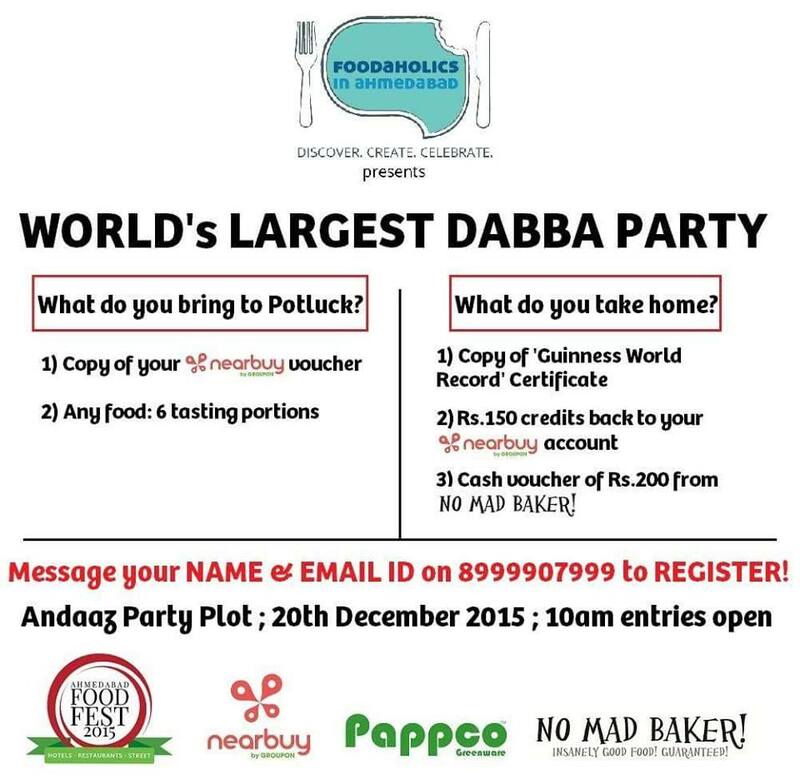 Ahmedabad based online community, Foodaholics in Ahmedabad, is all set to break Guinness Book of World Record for the Largest Potluck Party with around 2500 people sharing meal. Potluck is refereed to a gathering where each attendee contributes a dish to the grand meal. ‘Foodaholics in Ahmedabad’ is an online community hosting 33,000 active members who indulge in discussions, suggestions, exhibition and debates pertaining to food. “The need for having the Largest Potluck party is to emphasize people’s love for food and their need to express and exhibit their culinary skills to their fellow foodies. Also, it proves to be a community exercise where people get together happily and in a joyous atmosphere break bread”, says Esha Shah, co-founder of Foodaholics in Ahmedabad. This Record Breaking event is scheduled to take place at Ahmedabad Food Fest on the 18th of December, 2015 – 20th December, 2015 at Andaaz Party Plot on S.G.Highway, Ahmedabad. “Every attendee would carry with them food enough to serve six people and they will be spread out in one location tasting, eating and sharing food”, says excited Rohan Bhatt, founder of Foodaholics in Ahmedabad. We’ve done our part for our beautiful friends at FIA. Attending? Let us know in the comments below. We can’t wait to see you at Potluck! Gayatri Devi, the people’s princess and queen of poise. After twelve years of research, this man is recycling tonnes of plastic every year to make bikes!